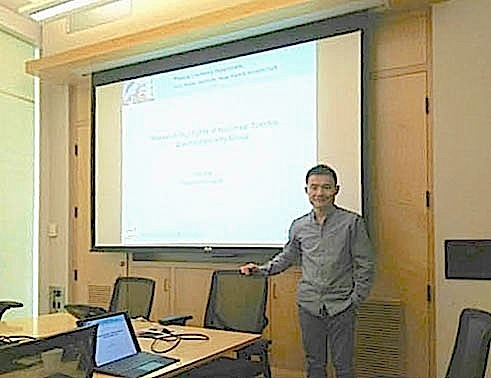 ▝ Thanks to the invitation of Prof. Igor Ying Zhang, Yujin visited the Department of Chemistry, Fudan University on Oct. 19 and gave a lecture about Probing fundamental electrochemical processes with vibrational sum frequency (SFG) spectroscopy. During his stay in Fudan U., Yujin also had fruitful discussion with Prof. Hongfei Wang, Prof. Wenbin Cai, Prof. Zhengyi Sun, Prof. Weitao Liu and Prof. Chuanshan Tian and Prof. Igor Ying Zhang. 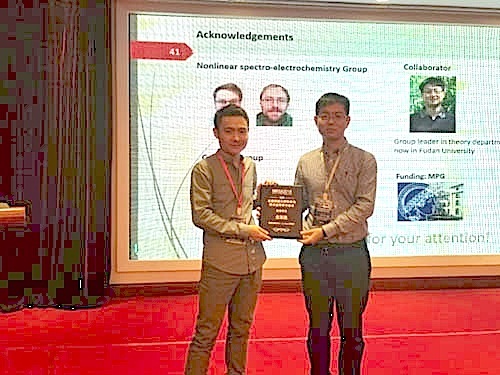 ▝ From Oct. 12 through 15, Yujin was invited to attend the National Meeting for Surface Science and Applications in Suzhou, China, and gave a presentation about Probing fundamental electrochemical processes with vibrational sum frequency (SFG) spectroscopy. During the conference, Yujin also visited the Vacuum Interconnected Nanotech Workstation (Nano-X) and also Prof. Yi Cuis lab in SINANO, and had fruitful discussion there. ▝ Yujin gave a Lecture to the graduate students of the international Max Planck Research School about Spectroscopy on at electrochemical interfaces in the block course of Functional Interfaces in Physics and Chemistry on Oct. 11 in the Technische Universität Berlin. Part of the slides can be found here. Yujin also took this chance to visit Prof. Shao-Horns group (MIT, Material Sciences & Engineering Dept.) and gave a group seminar. 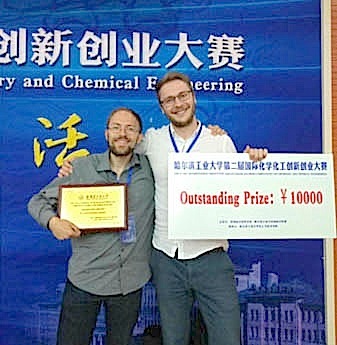 2018, Tobias and Gregor won the OUTSTANDING PRIZE for the 2nd HIT international innovation and entrepreneurship competition on chemistry and chemical engineering. Congratulation to Tobias and Gregor! ▝ March 11-16, 2018, Yujin and Gregor attended the DPG Spring Meeting in Berlin and gave talks about Probing ultrafast processes at electrode-aqueous solution interfaces with laser induced photovoltage measurements and Driving hyrodrogen evolution and oxidation on Pt with femtosecond laser pulses respectively. ▝ Between Feb. 19-23,2018, Gregor attended the International Max Planck Research Schools (IMPRS) workshop in Ringberg and presented his recent work about Driving Hyrodrogen Evolution and Oxidation on Pt with Femtosecond Laser Pulses (poster). 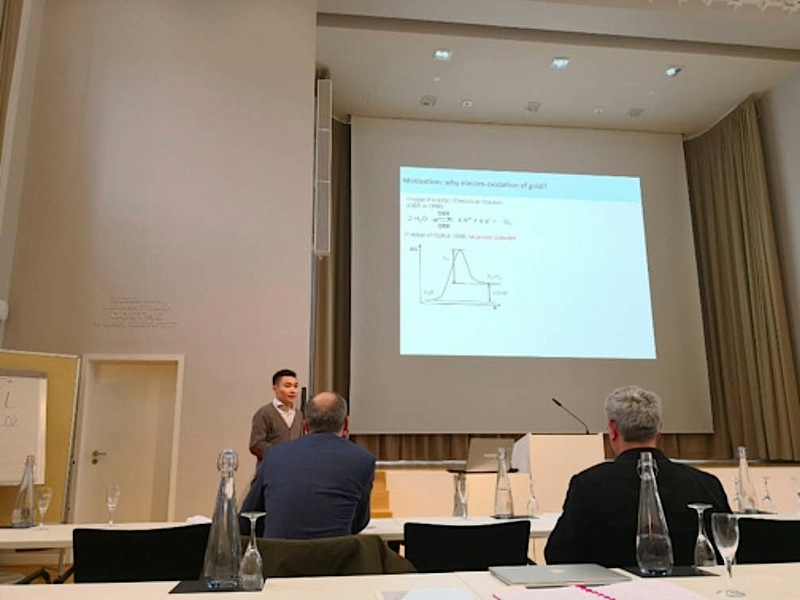 ▝ On January 28th, 2018, Yujin gave a talk titled Mechanistic studies of electrochemical oxidation of gold by interfacial specific vibrational spectroscopy at the 4th International Symposium on Chemistry of Energy Conversion and Storage in Harnack Haus of the MPG, Berlin. 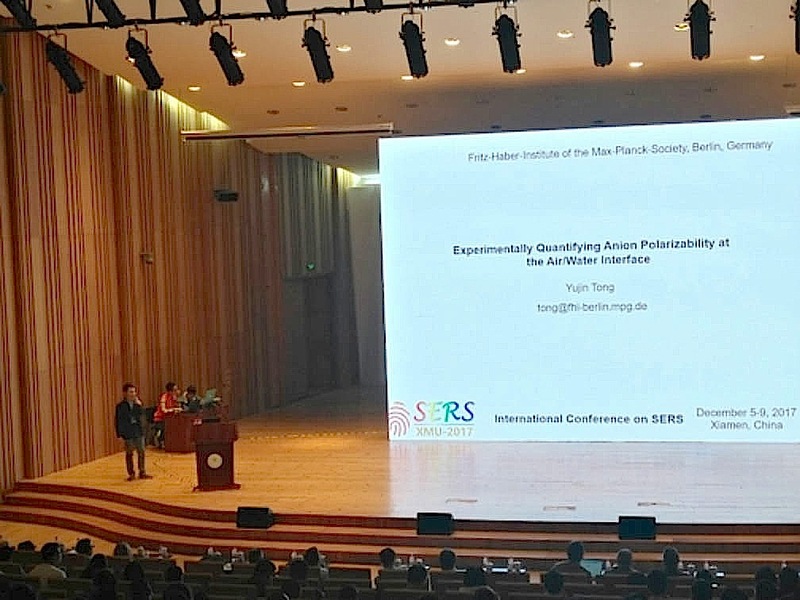 ▝ From Dec. 5 through 9, 2017, Yujin went to Xiamen University and attended the International Conference on Surface-Enhanced Raman Spectroscopy and presented the work about Experimentally Quantifying Anion Polarizability at the Air/Water Interface. ▝ At the beginning of December (Dec. 1-4, 2017), Yujin was invited to give a talk about Employing Vibrational Sum-frequency Spectroscopy to Study Adsorbate Structure at Electrochemical Interfaces at The 19th National Conference on Electrochemistry in Shanghai, China.